In the last ten years, literature on greening libraries has expanded considerably. Furthermore, by signing the Presidents’ Climate Commitment, university presidents and chancellors committed their institutions to finding new solutions to environmental, economic, and social issues through their teaching, research, and service operations. Since 2007, higher education has observed exponential growth of programs integrating sustainability literacy into teaching and research. Academic libraries must respond to this increasing focus on educating for sustainability and go beyond greening libraries to become active partners in advancing education and research for sustainability. 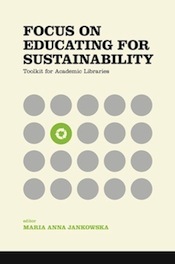 This edited collection captures the current status and future direction of libraries’ commitment to advance the focus of educating for sustainability. It is designed as a toolkit offering a wide range of best practices, case studies, and activities ready for implementation within academic libraries.